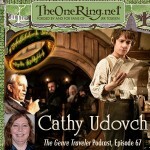 On a recent interview with ‘The Genre Traveler’ podcast: a discussion about the upcoming Hobbit production, Tolkien’s Birthday celebration on January 3, Tolkien activities in LA and many other Tolkien and Fantasty tidbits were discussed. This podcast does a regular show on all things fantasy and sci-fi related, typically interviewing authors, so you might consider subscribing to the blog. Follow the link for the Podcast and supporting material for all topics discussed.